If you want to feel like Superman on a bike then I suggest you check out the Swiss designed Stromer ST1 Platinum! 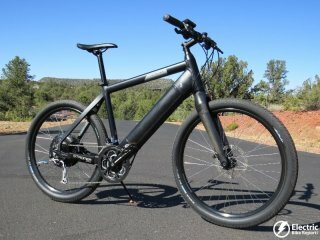 This bike is a pedal assist (pedelec) only bike that can reach speeds of 28 mph with electric assist; yeah that is flying. This bike is all about pedaling with a serious boost. The Platinum has a torque sensor built into the frame that senses how much you are pedaling and then provides you with electric assist based on the level of pedal assist you have selected (Eco, City, Tour, or Power). Long story short; the Platinum takes your pedal power and blends it with the bike’s electric assist to create a very intuitive feeling ride. 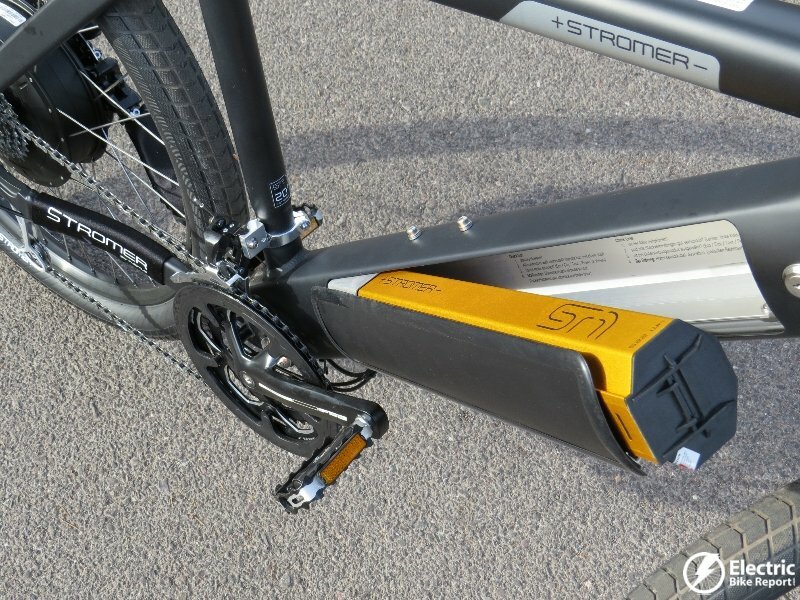 Another highlight of Stromer electric bikes is that they “hide” the battery pack in the downtube of the hydroformed aluminum frame for a nice look and good location for overall bike handling. 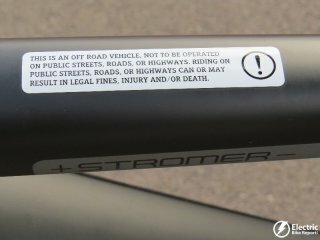 Make sure you check out the video, large detailed pictures and specifications of the Stromer ST1 Platinum to get familiar with fast e-bike. This full review of the Stromer ST1 Platinum will give you an idea of the ride characteristics, range test, pros, cons, and overall thoughts on this e-bike. 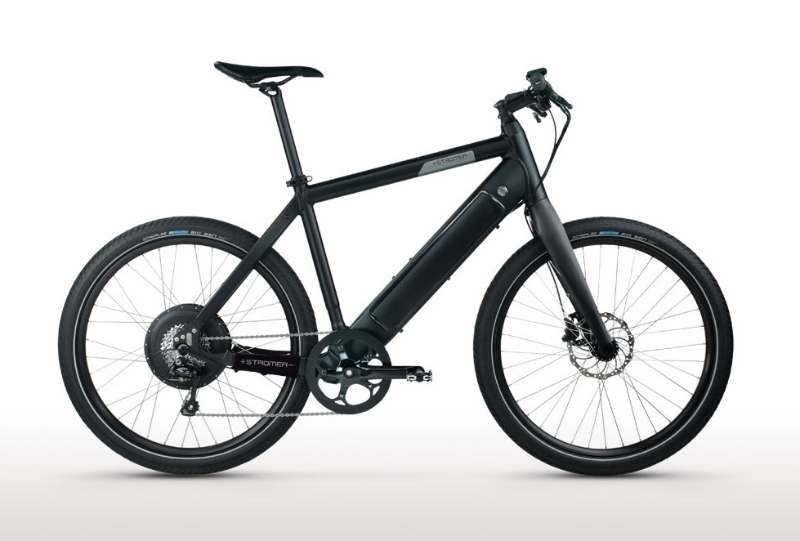 Please note that there is also the Stromer ST1 Elite that has a few different features and comes in at a lower price point; $3,399 instead of the $3,999 for the Platinum. More on the Elite in a bit. Off road only? Since the Platinum goes up to 28 mph with pedal assist it doesn’t fit the typical 20 mph limit of the US law. The US law is focused on 20 mph max for a throttle bike assuming the electric motor is doing all the work while the rider enjoys a free ride (no pedaling). There is some grey area when it comes to these pedal assist only bikes because the rider is contributing some power to achieve the speeds above 20 mph. Long story short; please understand that if you are riding this bike on public streets and roads above 20 mph with electric assist, you are doing it at your own risk. 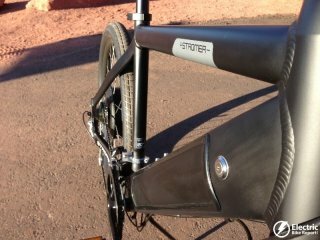 The hydroformed aluminum Stromer frames are an engineering marvel with the battery compartment in the downtube. “Hiding” the battery in the downtube is a cool aesthetic feature but it is also a great location for the battery because it keeps the weight low and centered in the bike and that is good for overall handling. Speaking of the battery, the Platinum comes equipped with a 36 volt 14.5 ah lithium ion battery pack. That is significantly larger than the typical 36V 10ah pack that is found on a lot of e-bikes. Since the Platinum can go faster it is nice to have a large energy source to handle the power requirements at those higher speeds. If you travel at lower speeds, say in Eco mode, you will get the benefit of more range with this large pack. More on the range test in a bit. Charging the battery can be accomplished while the battery is in the bike or when it has been removed. There is a charging port on the left side of the downtube for charging on the bike. For charging off the bike there is a charger adapter that plugs into the bottom of the battery. The ability to charge the battery on the bike (in the garage) or off the bike (in the house or office) is a nice feature because you may have a situation that requires both options. Charging takes about 3.5 hours. The 500 watt TDCM motor on the Platinum is a direct drive rear hub motor that is designed for the higher speeds, and you can definitely tell when riding it! It is pretty quiet compared to geared hub motors. There is a little noise when you first accelerate from a stop but once you are up to speed it is pretty quiet. 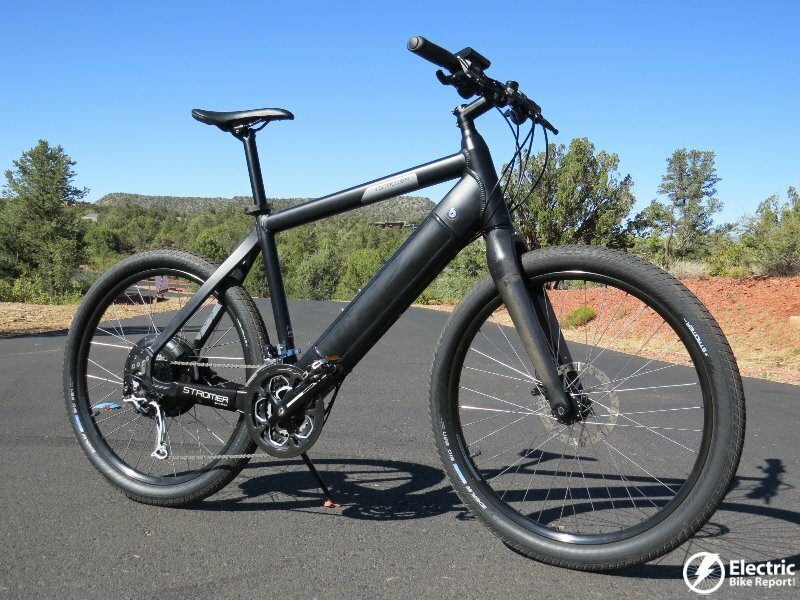 28 mph is pretty fast on a bicycle and the Stromer feels very stable at high speeds thanks to its large hydroformed aluminum frame, carbon fiber fork, Schwalbe Big Ben balloon tires, and Magura MT2 hydraulic disc brakes. 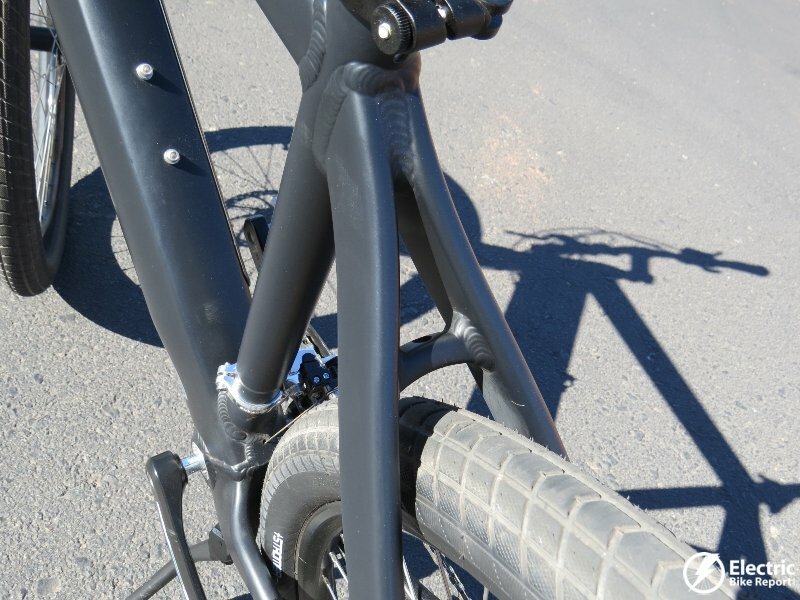 The Stromer hydroformed aluminum frames are built tough with big tubing and big welds. They also have a unique look with rectangular seat stays and well hidden cable routing in a recessed area under the downtube. 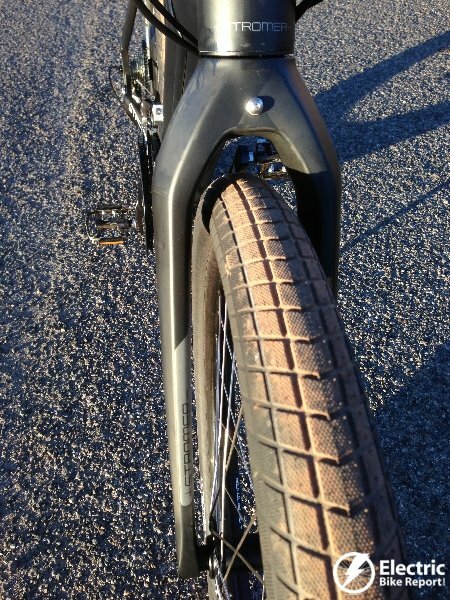 The large carbon fiber fork is definitely built for speed with its large fork legs and thru axle design. The thru axle keeps the side to side wheel flex to a minimum and that is helpful at high speeds. Stromer does offer a Suntour Raidon suspension fork option (for no extra $) if you would prefer a cushier ride. The Schwalbe Big Ben tires are cool looking and they offer a smooth, efficient ride while still providing good traction. These large balloon tires also help absorb some of the bumps in the road and they have a puncture protection design. 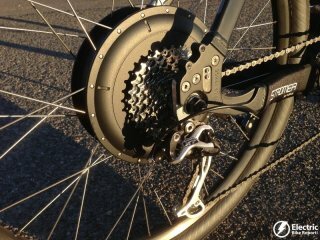 The Magura MT2 hydraulic disc brakes are nice and they do provide a healthy amount of stopping power with the 180mm rotors. The brake levers are large and you can grab them with all 4 fingers if you want. I found that they worked well with 2 finger braking. Please note that when traveling at 28 mph it does take longer to slow down than you would think. It is always good to be looking down the road a ways so you can anticipate obstacles that you may need to react to. The ST1 bikes do have regenerative braking that turns the motor into a generator to slow you down and put some of that forward momentum energy back into the battery pack. The regenerative or recuperation braking is engaged when the rear brake lever is squeezed. The traditional bicycle drivetrain components are a nice mix of Shimano and FSA. 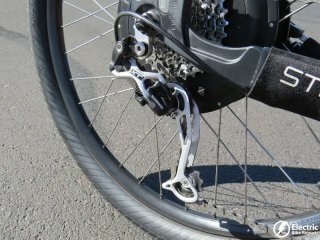 The highlight is the Shimano XT rear derailluer which is usually found on high end bikes. The front derailleur and shifters are Shimano Sora and overall the shifting was spot on. 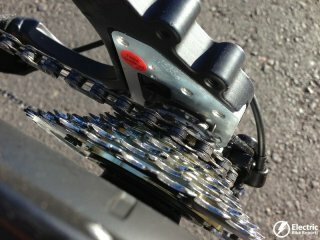 The 3 chainring FSA Tempo cranks combined with a 9 speed freewheel give you 27 different gear combinations to choose from. The display on the handlebars was very easy to use. At the display you can adjust between the 4 different pedal assist modes (Eco 150%, City 200%, Tour 250%, Power 300%) in addition to no assist, and the 2 recuperation modes. There is also the “Move” and “Boost” modes that may come in handy. The Move mode will put the bike into motion at walking speed and that may be useful in crowded areas or when taking the bike up stairs. The Move mode is engaged when in the Zero mode (no pedal assist) and the + button is held down. The Boost mode is a throttle type mode where you don’t have to pedal but it tops out at 12.5 mph. Boost can be used while holding the + button down when in Power mode but you have to be moving at least 1.8 mph. The display also has a backlight feature for riding at night. 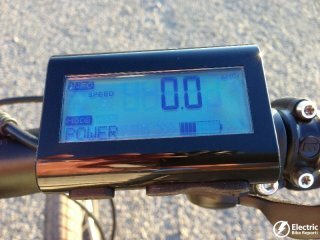 In addition to the bike controls there is the battery level info (graphical & percentage) and typical cycle computer info. You can select to see current speed, average speed, trip distance, odometer, trip time, and time. To top it all off there is also a “Lock” feature where you can lock the display from being used by someone else. In this mode you will need to enter your 4 digit code to unlock the display. It only locks the display so make sure you lock up the bike too! If you are looking to make the Platinum complete with accessories there are 2 Stromer issue City Kits. The A kit includes front and rear B&M lights and kit B includes Supernova lights. Both kits also include a Pletscher Optima kickstand, Stromer fenders, and a Tubus Stromer Racktime System. Kit A adds $360 and Kit B adds $475 to the $3,999 price of the Platinum (price at time of review). Speaking of accessories, the Burley Travoy is a commuter/cargo trailer that works well on the Platinum. Just take it easy on the speed when you are hauling cargo. 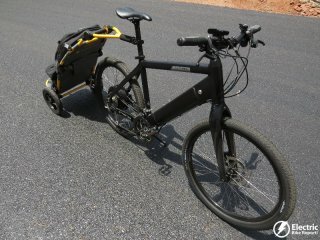 Here is a review of the Burley Travoy. Riding the bike: This bike can get you up to 28 mph in a hurry on Power level; this is the pedal assist level that makes you feel like Superman! Riding at 28 mph is an exciting experience but you also need to be even more aware of what is around and ahead of you because things come up quick at that speed. Eco mode comfortably cruises around 20 mph but you can go faster with some assist, it’s just that you will be doing more of the work to get above 20 mph. City and Tour are nice intermediate settings between Eco and Power. You can definitely feel a difference between each assist level. 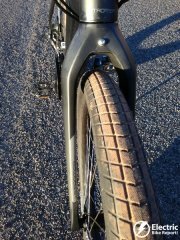 Did I mention how smooth and intuitive the pedal assist feels on the Stromer? This really is the highlight of the bike. 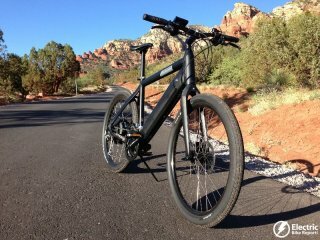 Stromer has done a great job of blending the human power with electrical motor power to create a smooth ride. 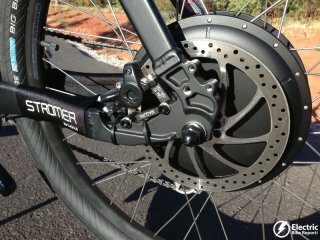 The bike responds quickly when you put power to the pedals and it also eases off the power when you pedal lightly. 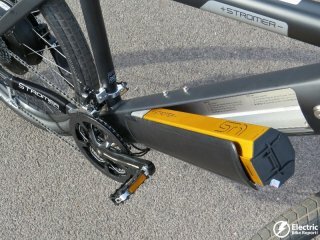 If you are a person that likes to pedal then you will appreciate the responsiveness of the Stromer pedal assist system. 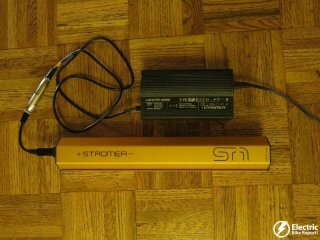 Again, the Stromer bikes do a great job of blending your pedal power with the bikes motor power to create a very fluid, high performance feel. Climbing on the Platinum was pretty good but this bike is really designed for speed. The Platinum’s ST1 counterpart, the Elite, is designed more for climbing steep hills because of its higher torque motor (40 Nm compared to 30 Nm on the Platinum). While the Elite has more hill climbing capability, it tops out at 20 mph instead of 28 mph. The Platinum that I rode (with the carbon fork) offered a solid ride and I mean that in almost every sense. It felt like a solid-no flex ride in regards to feeling stable at high speeds. And I also mean that in the sense that you feel a lot of the bumps and cracks in the road, especially when riding at high speeds. If you live in a smooth riding area then the rigid frame and fork will probably work well. If you want to smooth things out I would recommend going with the suspension fork option and adding a suspension seatpost. The Platinum has a urban e-bike racing machine feel. It is a fast and responsive pedal assist bike based on a mountain bike platform with the relatively smooth and wide Big Ben tires. This gives an overall fast but very stable feel. In alignment with that feel is the way that you are positioned on the bike. It is somewhere between being crouched down for performance riding and a somewhat upright position. It lends itself to being performance oriented (considering you are doing some of the work), while being up right enough to be aware of what is going on around you. The Stromer saddle is more of racing type saddle; again intended for more performance style riding. I found it to be comfortable but that is such an individual preference. Here is the real world information on how the Stromer ST1 Platinum electric bike performed on my typical riding circuit that includes hills, flats, traffic, wind (when available) etc. While testing these bikes I like to put them through the toughest conditions (Power mode with light pedaling) to see where their bottom line is in regards to range and speed. Range: As you can see from the GPS info that I recorded, the ST1 Platinum traveled 28 miles and did a total elevation gain/loss of around 2,200 ft. Considering that I weigh 190 lbs and I pedaled very lightly this is very good range for a 36 Volt 14.5 ah battery pack (522 Watt Hours) with a 500 watt motor traveling at high speeds! Speed: The ST1 Platinum can get up to around 28 mph when using the Power mode and some pedal power. Using Eco mode and some pedal power the bike settles in comfortably around 20 mph but you can certainly pedal it faster and you will still get some assist. The Platinum does pretty well on the hills but it was really designed for speed. The Platinum motor has 30 Nm of torque and can spin up to 28 mph. If you are looking for more hill climbing capability the ST1 Elite has a higher torque motor (40 Nm ) but it tops out at 20 mph. The weight distribution of the Platinum is a little back heavy due to the large direct drive motor. The battery location is good because it keeps that weight centered and fairly low to the ground, which is good for the overall handling of the bike. Fast Pedelec! If you are looking for a high performance, fast, pedal assist bike then the Platinum should be on your list of e-bikes to seriously consider. The overall design of this bike is focused on speed and a high performance ride feel. The way the bike blends your power with the motor power is very intuative. Battery Location: The battery in the downtube of the frame is a highlight of the Stromer e-bikes. It “hides” them well and it is a great location for the overall handling of the bike (low and centered). It is nice that you can charge the battery on or off the bike too. Battery Size: The large 36V 14.5ah pack is a very nice feature on the Platinum. Batteries are one of the most expensive components of an electric bike and it is nice to have this larger pack for going fast (Power mode) or for getting more range from one of the lower pedal assist modes (Eco, City, Tour). Nice Components: From the hydroformed aluminum frame, carbon fiber fork, Shimano/FSA drivetrain, Magura hydraulic disc brakes, to the Schwalbe tires, the Platinum is decked out with a very nice mix of components that should last a long time. 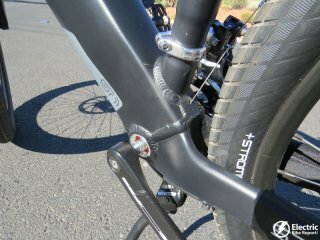 Rigid Ride: The Platinum that I rode was not the suspension fork option (carbon fiber fork) and that combined with aluminum frame proved to be a pretty rough ride on roads that had some bumps and cracks. This was especially true at the higher speeds. If you want a smoother ride I would recommend going with the suspension fork option and adding a suspension seatpost. Assist from Stop: This may be a con for some people, but not all. When you put your foot on the pedal while the bike is stationary it will engage the pedal assist immediately. Some e-bikes do not add assist until you are going 2+ mph so that you won’t be surprised by the assist if you are at a stop and did not intend to go. 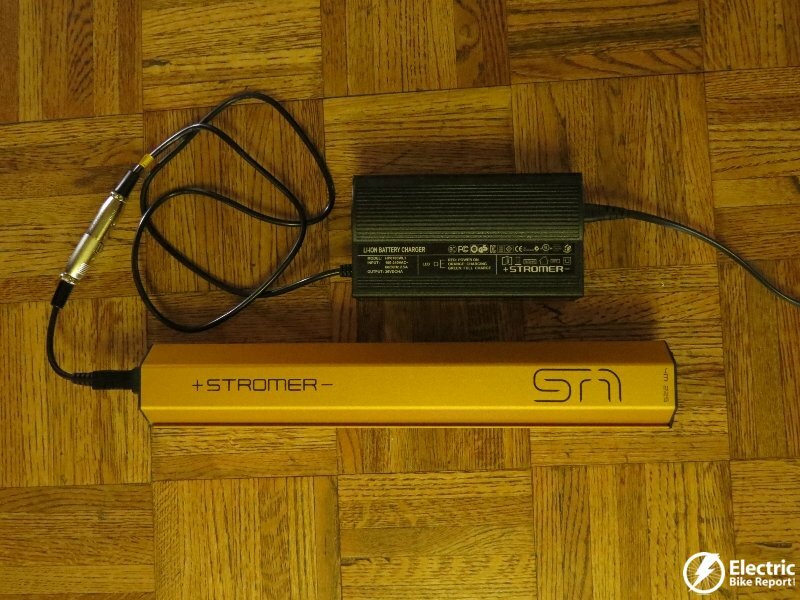 On the other, if you are used to a quick response, torque sensor pedal assist system like the Stomer has, it can be a nice feature if you are trying to accelerate quickly from a stop though an intersection. Please note that if you are squeezing the rear brake lever, it has an electronic switch that will cut the assist power until you release it. Front Brake Switch: As I mentioned above the rear brake lever has an electronic switch that will cut the power if the brake lever is squeezed. The front brake lever does not have the electronic switch so if you only use the front (say at a stop) the assist system can still engage if you are putting pressure on the pedals. Most e-bikes have the brake switches on both front and rear brake levers and it would be nice to see this on the Platinum. Overall the Stomer ST1 Platinum is a fast, high performance, pedal assist electric bike that is all about getting you from point A to point B very quickly. It is a bike designed for people that like to pedal but who also want to feel super human while they are doing it! The Platinum provides a fluid blend of human and motor power, a large battery, high quality components, and a fun performance oriented ride. 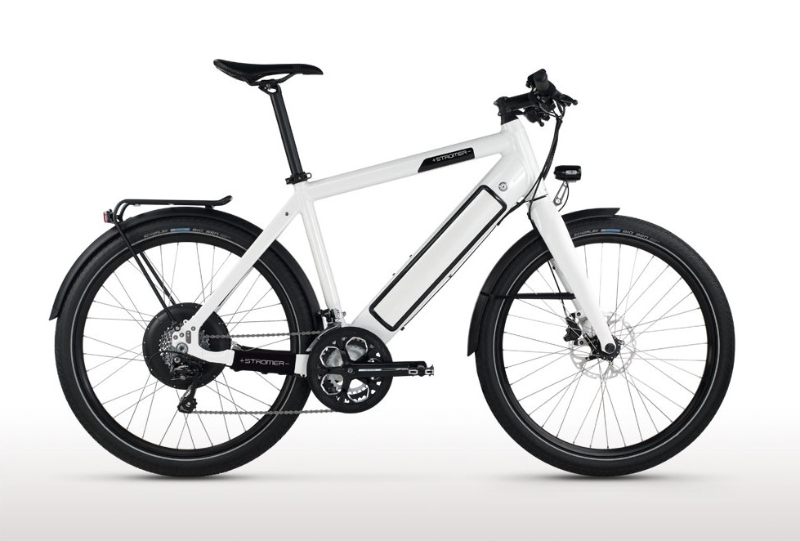 Just note that since this is a high performance e-bike that the ride can be a little rough (unless you go with the suspension option), and you need to be aware of how the pedal assist system engages. 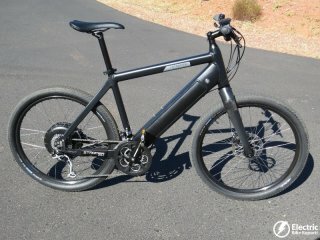 The Stromer ST1 Platinum retails for $3,999 at the time of this review. Where to buy the Platinum? Check with Stromer for a dealer near you. Do you have any questions about the Stromer ST1 Platinum? Do you own the Platinum? Please share your thoughts in the comment section below. I have the ST1 Platinum with suspension fork and it is still too stiff a ride. Perhaps they should put different wheels on the bike? You can take the air pressure down a bit on the tires and it will soften the ride up a bit. It won’t be as efficient, but it will be more comfortable. You might also want to consider swapping the seat and possibly adding a suspension seat post like the Thudbuster, which is quite popular in the ebike community. Great report, and what certainly sounds like a very well made and designed bike! Thanks. I am not so sure about the boost mode. Balloon tires are great for the stability of the ride. I pace competitive racers on ST1, and cornering is great. Having said that, Stromer ST1 Platinum is not for everybody. One needs a significant experience with handling, accelerating, and changing gears.With lesser torque, gears and ability to use them correctly is crucial. Another question I am having – why does it have 2 recuperation modes? A great bike for an experienced, and really fit cyclist. Above all it still provides a great deal of challenge at the high speed. I have a 36 mile round trip commute (ugh). Hilly is a relative notion, but I have trouble cycling up one hill on my road bike! Several short, steep climbs. Several long, gradual climbs. 90 minutes each way. Question. Shortening the trip time would be great. Decreasing the climbing effort is at least as important, if not more so. Question: which is a better choice? The Elite with a 14 amp battery option and more torque, or the Platinum with its 27 speeds and less torque? For a round trip without charging in between I would recommend doing the Elite with a 14ah battery. The Elite motor draws less power from the battery and so it would give you the best range. A 36 mile hilly ride is going to drain the battery pretty far so it would be good to bring the charger with you or keep a spare charger at work and bring the battery inside with you. If you could charge at work then you could do the Platinum, have a higher top speed, get to work sooner, and charge while there so you have a full battery on the way back. If that’s an issue, go with the less power thirsty Elite model. I have the ST1 platinum all I can said is WOW it is fast. I commute to work 9 miles one way. I can get to work in 17 min. I use up 22% of battery juice when I arrive at my job. I find myself on my day off wanting to ride this bike to run my errands. I would highly recommend going to check one out.